While lip swelling is commonly caused by sudden trauma or inflammation after dental work, a number of other conditions can cause them to swell. Swollen lips may be a symptom of oral allergy syndrome (OAS), which can be triggered by certain foods or medications. Another allergic reaction more concerning than OAS is called angiodema. 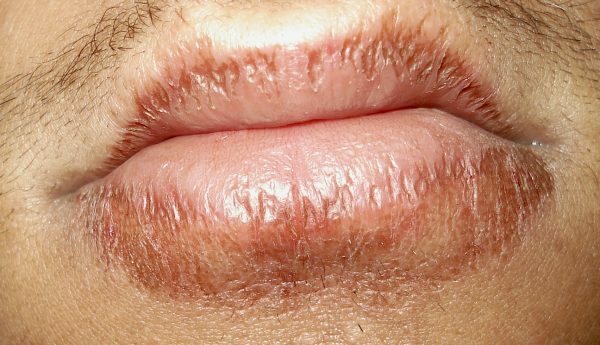 It causes a rapid swelling of the lips, face, and tongue, sometimes accompanied by redness or bumps that make it more difficult to talk. OAS usually disappears on its own, but angiodema can be life-threatening and should be taken seriously. Tingling lips may result from things such as stress or exposure to cold temperatures. However, it can also be a sign of a stroke or transient ischemic attack (TIA), which may occur when normal blood flow gets obstructed, starving the brain of oxygen. Even though TIAs are called mini-strokes (because they last only a few minutes and won’t cause lasting damage), experiencing a TIA very likely means a full-blown stroke is on the way. There are also cases where food poisoning may cause tingling in the lips and tongue. It can develop soon after eating contaminated foods or foods that have been left out of refrigeration for long periods of time. Chapped lips, also known as cheilitis, can be caused by several things, such constant exposure to environmental factors like: lip licking, cosmetics, and cold or dry weather. All of these factors can dry out the skin barrier, leading to irritation, inflammation, flaking, or cracking. Chapped lips can usually be treated at home. Apply lip balm or Vaseline and drink more water to make sure that your lips have enough moisture throughout the day. Wrapping your mouth with a scarf can also protect your lips from cold weather conditions. A red ring around the lips can signal a number of different conditions. 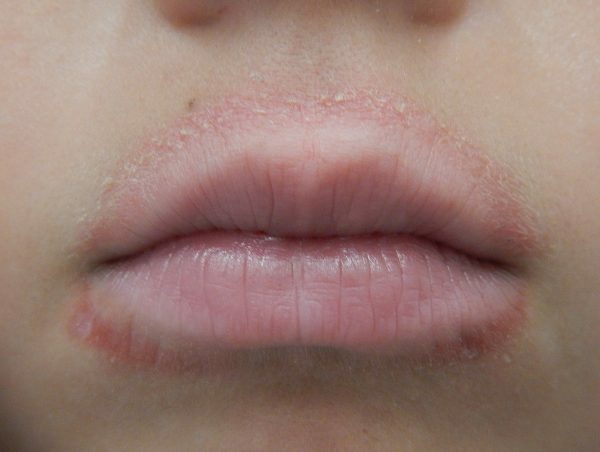 The most common of which is called lip-licker’s dermatitis. The cause of this irritation of the skin is quite self-explanatory. Repetitive licking of lips allows saliva to dry out natural oils from the skin around the lips, making them red and itchy. Treatment would involve kicking the habit of licking the lips and remoisturizing affected areas. The red ring around your lips could also be caused by an allergic reaction to certain foods like wheat, diary, soy, or soda, in which case, the most effective treatment would be changing up your diet. Cracking at the corners of the mouth, also known as angular cheilitis, can be quite irritating and can be caused by various nutritional deficiencies. A lack of iron, for instance, means that skin cells are unable to regenerate quickly enough, leading to broken skin. Since vitamin B also contributes to healthy skin, a deficiency can cause a variety of skin problems including split lips. Low levels of zinc can also lead to cracking at the corners of the mouth. Angular cheilitis can also be an indication of diabetes. People with diabetes have too much glucose in their blood. The high level of blood glucose encourages the growth of fungi like candida, affecting the thin skin at the corners of the mouth. When lips start to shake or tremble involuntarily, it may be caused by a miscommunication between the lip nerve and the muscles it controls. This could be due to something as simple as drinking too much coffee. However, it could also be a sign of a larger medical problem. Parkinson’s disease is known to cause tremors in lips, as is Tourette syndrome, a condition that causes both motor and speech tics, which can make daily life more difficult. 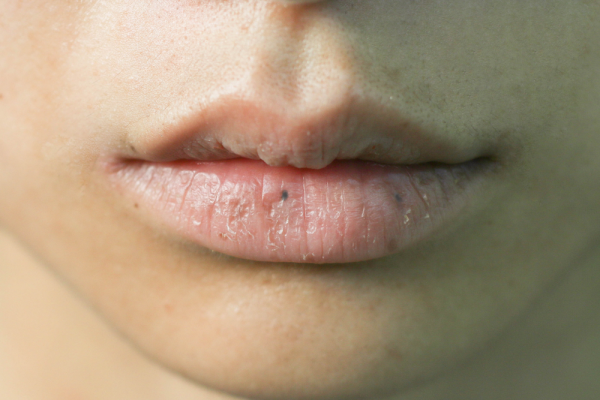 Dark or black spots on lips can appear for various reasons. Melasma is a common condition that can cause dark patches to form on the face. Although melasma usually fades with time, you can prevent an existing condition from worsening by protecting yourself from the sun with sunscreen. An excessive intake of iron can also lead to a similar skin condition. In some cases, though, black spots on the lips could be an indication of cancer, in which case, look out for other symptoms such as rapid increase in size, open sores, or unusual color. Lips are reddish because the thinness of the skin allows blood vessels to become more visible, and anything affecting the blood will show through the transparent skin of the lips. If your lips have gone from a rosy red to a pale pink, you may be suffering from anemia, low blood sugar, or lack of sun, in which case, increasing your vitamin-D level by getting more sun exposure should help. However, if the lips take on a blueish hue, that could be the result of the blood not getting enough oxygen due to a heart or lung problem and should be taken more seriously. 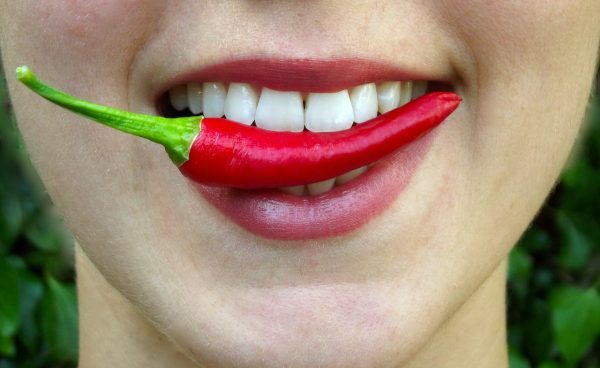 If you’re experiencing a burning sensation in the lip area (assuming that you haven’t eaten any super-spicy peppers in the last 15 minutes), it could be a sign of an underlying medical issue. Burning pain in the lips, sometimes in the throat and tongue as well, is usually associated with vitamin-B12 deficiency. However, research also suggests that a burning sensation in the mouth may be caused by malfunctioning nerves in the head and neck, which might explain why this feeling is so commonly seen in people who suffer from depression, anxiety, or some other psychological disorder. 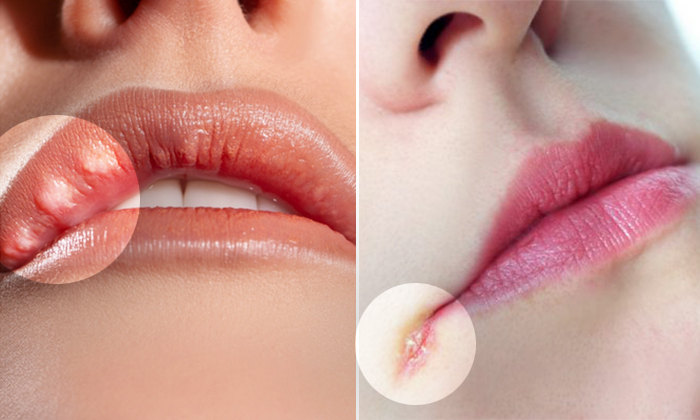 Lip bumps come in difference sizes, appearances, and with various symptoms, ranging from red bumps to small blisters that are hardly noticeable. 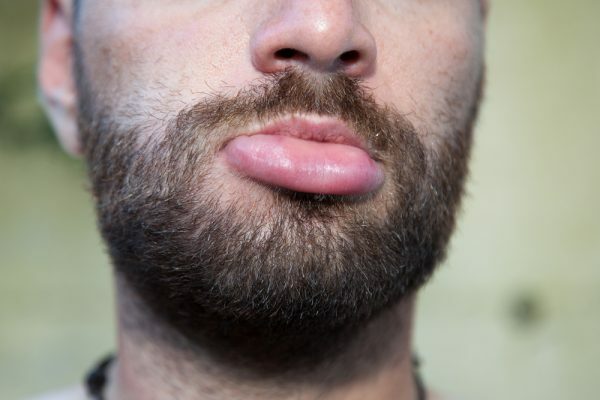 An allergic reaction may cause inflammation of the lips followed by a bump, which normally disappears on its own after a while. The common viral infection known as herpes simplex virus (HSV) can also cause cold sores on the lips and around the mouth. The virus usually remains dormant in your system, and is activated by stress, fatigue, or hormone level changes. Cold sores are harmless, though they do signal that you may be overly stressed or need to get more sleep. In rare cases, lip bumps can be a symptom of a cancerous tumor developing in the mouth, which begins as a small sore or bump appearing on the lips that will not only not heal but will continue to grow and spread to the inside of the mouth. Disclaimer: This article is for informational purposes only and is not a substitute for professional medical advice. 10 Things Your Hands Can Tell About Your Health—Do Your Hands Ever Feel Like Pins and Needles?